The Christmas holidays may be a great time for turkey, plum pudding and sledding (if you have the weather for it), but one of the other things I love about the season is the feeling, after the main festivities are over with, that it's okay to slow down and smell the roses or, er, the snowflakes. I haven't been doing any writing during the past few days but I've been doing a heck of a lot of movie watching (including the adventures of my childhood hero Tintin!) and reading. One of the novels I devoured over the holidays is Amplified by Tara Kelly, which I'd been especially looking forward to tackling because I have a big ol' crush on rock fiction. Now I can officially say I have a big ol' crush on Amplified too. Main character Jasmine Kiss is an awesome guitarist, one hell of a strong girl and one hell of a mess too. Delicious drama with a hard rock edge. 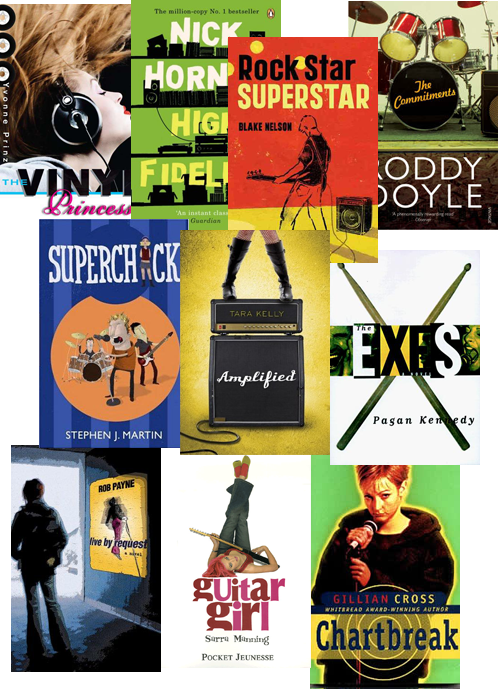 Reading Amplified prompted me to put together this list of my favourite rock fiction. It was originally intended to be a top ten list but I couldn't decide which of the Superchick trilogy novels should make the list and even if I just named one, that would've left me with a top eleven list. Most of the below descriptions are the publisher's (because I'm lazy at this time of year and have a bad memory at the best of times) but they're all fantastic, highly enjoyable books, some of them YA and some of them adult. I consider them all perfect examples of crossover books, ones that would appeal equally to older teen and adult readers. When privileged 17-year-old Jasmine gets kicked out of her house, she takes what is left of her savings and flees to Santa Cruz to pursue her dream of becoming a musician. Jasmine finds the ideal room in an oceanfront house, but she needs to convince the three guys living there that she's the perfect roommate and lead guitarist for their band, C-Side. Too bad she has major stage fright and the cute bassist doesn't think a spoiled girl from over the hill can hack it. . . . When Janis Finch storms out of a family row, it starts a chain of events which transforms her whole life. For it's in the motorway cafe, minutes later, that she meets the unknown rock band, Kelp, who talk her into coming to their gig that night. Janis goes along for the ride and finds herself increasingly provoked by Christie, Kelp's arrogant lead singer. He pushes her into singing with them, and winds her up into a fever of rage, awe, and attraction. So when Christie asks her to join the band, Janis feels powerless to refuse—and her life explodes. Barrytown, Dublin, has something to sing about. The Commitments are spreading the gospel of the soul. Ably managed by Jimmy Rabitte, brilliantly coached by Joel 'The Lips' Fagan, their twin assault on Motown and Barrytown takes them by leaps and bounds from Paris Hall to immortality on vinyl. But can The Commitments live up to their name? A hip and hilarious tour of the world of rock 'n' roll. The Exes, an up-and-coming indie band, is made up of people who used to be lovers. Progressing from jam sessions in a basement to second-rate clubs to a cross-country tour that requires them to share seedy hotel rooms—with their exes—the four band members reveal their quirks, their problems, and their fantasies in alternating narratives. * Girl (by Blake Nelson, 1994) Meet Andrea Marr, straight-A high school student, thrift-store addict, and princess of the downtown music scene. Andrea is about to experience her first love, first time, and first step outside the comfort zone of high school, with the help of indie rock band The Color Green. *There's also a sequel called Dream School which came out on December 6th. Pop music junkie and record store owner Rob finds that his myriad diversions after the breakup with his longtime girlfriend are not as entertaining as he thought they would be. This international bestseller was Nick Hornby's first novel. On paper, Jay Thompson is a 26-year-old bartender going nowhere. But his burning desire is to be a working musician, or failing that, a working songwriter. Together in pursuit of the dream is his band, Archangel: Tyler, headstrong composer of the experimental rock opera "Space Oddity"; Jan, the sassy bass player and object of Jay's affection; and Noel, the Gap-wearing, scissor-kicking guitar player, who spends his days labouring in the corporate world. Set on the Canada-US border, Live By Request follows the exploits of a band on the run from bscurity, boredom, and sometimes, even themselves. Music is Pete’s life. He’s happiest when playing his Fender P-Bass. He doesn’t care about prestige or getting girls; it’s the quality of the music that matters. Then he meets the Carlisle brothers. They can’t sing and they can barely play, but somehow they have a following. Pete can’t resist, and he joins The Tiny Masters of Today. When the band gets a chance at real stardom, Pete wonders if he’s ready. He knows the music should come first . . . but who knew selling out could be so much fun? The Superchick trilogy follows Jimmy Collins' journey from Dublin middle manager to full-blown rockstar along with his perpetually randy bandmate Aesop. All three novels absolutely bleed Irish sensibility which is a big part of their charm. I keep hoping some talented filmmaker will get them onto the screen and give these books the exposure they deserve. Summer's here, and 16-year-old Allie, a self-professed music geek, is exactly where she wants to be: working full-time at Berkeley’s ultra-cool Bob and Bob Records. There, Allie can spend her days bantering with the street people, talking the talk with the staff, shepherding the uncool bridge-and-tunnel shoppers, all the while blissfully surrounded by music, music, music. It’s the perfect setup for her to develop her secret identity as The Vinyl Princess, author of both a brand-new zine and blog. From the safety of her favourite place on earth, Allie is poised to have it all: love, music and blogging . . .or is she?